The majestic and haunting beauty of the Italian Alps is the setting of the first meeting of Enza, a practical beauty, and Ciro, a strapping mountain boy, who meet as teenagers, despite growing up in villages just a few miles apart. At the turn of the last century, when Ciro catches the local priest in a scandal, he is banished from his village and sent to hide in America as an apprentice to a shoemaker in Little Italy. Without explanation, he leaves a bereft Enza behind. Soon, Enza’s family faces disaster and she, too, is forced to go to America with her father to secure their future. 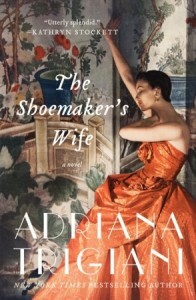 Lush and evocative, told in tantalizing detail and enriched with lovable, unforgettable characters, The Shoemaker’s Wife is a portrait of the times, the places and the people who defined the immigrant experience, claiming their portion of the American dream with ambition and resolve, cutting it to fit their needs like the finest Italian silk. This riveting historical epic of love and family, war and loss, risk and destiny is the novel Adriana Trigiani was born to write, one inspired by her own family history and the love of tradition that has propelled her body of bestselling novels to international acclaim. Like Lucia, Lucia, The Shoemaker’s Wife defines an era with clarity and splendor, with operatic scope and a vivid cast of characters who will live on in the imaginations of readers for years to come. My thoughts -- I cannot begin to tell you how much I truly loved and enjoyed this novel. Adriana Trigiani is a master at weaving words into dream like sentences that sweep the reader off to the picturesque Italian Alps, through the bustling city of New York and to the bitterly cold plains of Minnesota. Through her beautiful words, the reader gets to fully know and understand each of the main characters -- what drives them, their heart aches, and more importantly their determination. While the book spans several decades of the characters lives, it went by much too quickly. Once I started reading, I had to know what came next in the lives of Ciro and Enza, and read the nearly 500 pages in about a day and a half. The masterful storytelling in this book immediately connected and bonded me to the characters. The plot is so moving that I literally wept more than once. The book is partially based on Trigiani's own family history, I definitely had the nostalgic feeling I was sitting at a grandparent's knee listening to them spin this wonderful tale. I wholeheartedly recommend this engaging novel. Its definitely one of the best books I've read this year and I cannot wait to read more by this dynamic author. 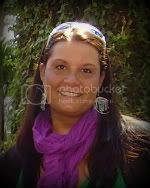 You can learn more about Adriana Trigiani by visiting her website and reading the other reviews by stopping by the TLC Book Tours site.